Rory McIlroy is in search of a state-side pad. 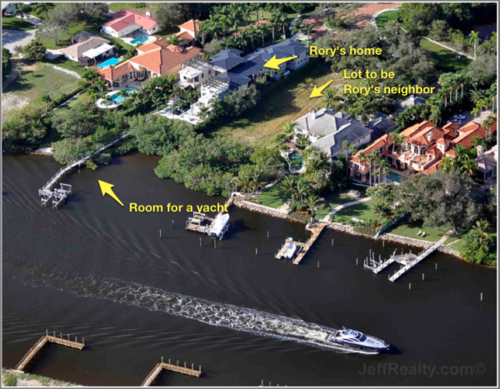 Jeff Lichtenstein has reported that a one Rory McIlroy has nearly completed a purchase in the Palm Beach Florida area. This would be a nice Christmas present for himself considering how hard he has worked this past season. McIlroy's net worth is projected to finish at 20 million by the end of the year. Rory is hoping to grab the house for the hefty price of 9.5 Million to close out this wonderful year. It may seem like a bargain, but the current owner only payed 7 million to build the mansion. So he has done well to turn such a lovely profit even in this harsh economic climate. This home will provide McIlroy with a place to chill out during the off season and really begin to enjoy the perks of being the number 1 golfer in the world.